Welcome to Digital Technology 2019! As we know the world is becoming more and more digital and is changing the way we live. As a result, digital skills are becoming more important and relevant. In Digital Technology we cover at both Year 7 and at Year 8 how to be safe online as well as responsible computer use. 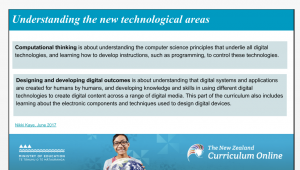 Year 7 and Year 8 students have a different program they run through, both focused on the strands of Computational Thinking for Digital Technologies and Designing and Developing Digital Outcomes. Students will work through how to organise files on their device – whether it be physically on the computer or saved to the cloud; how to use different applications efficiently; learn to be selective about which tools to use for the current purpose; how to identify reliable sources of information; how to find, organise and cite information online; how to utilise the computer as a learning tool; how to code and solve problems when the code doesn’t work properly; and making students feel digitally confident in a digital world. Looking forward to another fantastic year.